An effective marketing campaign considers the use of every method to reach potential customers and generate leads, including both off-line (traditional) and on-line methods. This means reviewing just about every one that has ever been successfully utilized. To locate a comprehensive list, the first place that comes to mind is the index page of textbooks on marketing. After viewing a couple of indexes, it is easy to compile a complete checklist of available choices. Every business uses different method combinations to sustain success. For any campaign to be effective, understand the target market, then select a method that suits the target. Obvious examples are: an expert offering SEO (Search Engine Optimization) services would market to prospects who already have websites, probably reaching the prospect via the published email contact form on their site. Website designers may instead use telemarketing or direct mail, since it would be difficult to find an email address for a business that does not yet publish a site. Most brick and mortar small businesses choose traditional methods like yellow pages, direct mail, newspaper ads, but few include a website. These methods are what they know, because for decades they have been the cornerstones of reaching their clientele. But these methods are very expensive. To guarantee market saturation they use a shotgun approach; big ads in the yellow pages and mailers to every address. Shoot enough times with enough ammunition and you will hit something. In other words, by repeatedly sending the same ads, to the same target market, every prospect should eventually see the ad. One of the problems for businesses today, is too many off-line choices. There are several yellow pages in most communities, and none of them have complete listings, translating to only partial market penetration. Additionally, there is no tracking for the advertiser to know how many prospects are looking for them, how many have found them, or how many return to read their ad a second time. Direct mail improves slightly on the yellow pages, but has similar problems; their effectiveness is only measured by how many coupons are redeemed compared to how many pieces are mailed. Advertisers have no idea how many times their ad is actually viewed. No traditional off-line form of advertising provides in-depth tracking and without it, one can only speculate what to change or improve. For the business person it is hit and miss. This kind of marketing approach is rapidly changing. What marketing method can get advertising not just delivered, but opened and read by prospective customers? Internet marketing. According to the Internet World Stats website, 76% of American households access the Internet on a regular basis. They are there looking for content that targets their interest. On the Internet, a website's message is available all day every day, delivering each businesses unique selling proposition. It is relatively inexpensive because it not only avoids the wasteful, repetitive, shotgun approach, it captures tracking data, measuring the advertising campaign's effectiveness. Analyzing the results helps a business improve it's marketing message and convert more leads to customers. Moving an off-line business to one on-line and capturing the off-line business niche is essential to success. Doing it correctly requires using a knowledgeable on-line marketing specialist who knows how to blend both off-line and on-line methods; some one who understands the market and the secrets to positioning the local business in a top search position. These consultants typically use permission marketing methods, encouraging follow up, and loyalty building programs for repeat customers. The correct specialist will use techniques moving all potential prospects from costly hit and miss advertising, to personal promotions requested by the prospect themselves. This personalization captures and improves customer loyalty with each contact. It reduces cost, because the website, once established, does not incur the same high ongoing cost of the yellow pages and direct mail. An Internet presence, produced by the right consultant is essential for every one in business today. 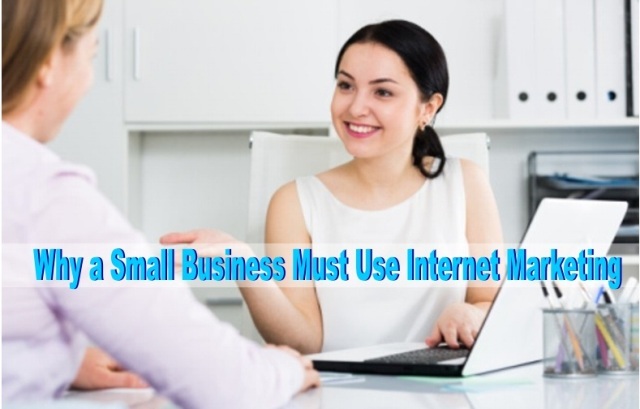 4 Responses to "Why a Small Business Must Use Internet Marketing"
Thanks for your comment! Glad if you found it helpful.